The bz Gas Detector is a simple but robust approach for addressing chemical threats on oil and gas rigs as well as industrial sites. By providing adaptability and expandability the bz Gas Detector addresses an evolving threat in the most affordable way possible by avoiding built-in obsolescence. In addition to gas and chemical sensors, more common environmental sensors such as temperature, pressure and humidity also are available. The bz Gas Detector has both a large daylight readable display and an LED light indicator system, which transitions from red to green to indicate if the gas is becoming stronger or weaker. The LED lights allow a user in a HAZMAT suit to monitor chemical sources without constantly monitoring the display. Once a chemical source is detected, then readings can be collected via the digital screen. The bz Gas Detector is protected by a hardened Thermo-Plast case that can withstand temperatures up to 5000 F for short periods of time without damaging the detector electronics. Each detector comes with custom integration software, enabling the user to perform updates and calibration, preventing downtime and service calls. The bz Gas Detector automatically communicates with bz Mesh Networks sensors. Sensors establish self-forming wireless mesh networks that enable data flow back to a bz-developed or customer provided Control Center Interface. The bz Gas Detector automatically communicates with the other bz Mesh Network sensors. Sensors establish self- forming wireless mesh networks that enable data flow back to a bz-developed or customer provided Control Center Interface. Upon the detection of hazardous gas levels reaching above established thresholds, the bz Gas Detector can be configured to send commands to the bz Control Interface that control solenoids and relays to shut down power to critical equipment. The bz Gas Detector’s adaptability and scalability allow the end user to address the needs of today while providing a cost-effective method for growth in the future. Recognizing potential hazardous work conditions and having the ability to make swift, intelligent decisions is key to worker safety and business productivity. The bz Estop provides a wireless, emergency shut-off for key equipment that can initiated on-site or from a remote location. By utilizing the bz Mesh Network, the bz Estop can provide an abort signal over long ranges without requiring dedicated control wiring, thus keeping inherent dangers of complicated and unexpected situations at bay while protecting your people and equipment. Working in conjunction with the other bz Sensor Solutions family of products, safety measures can be initiated manually through the bz Estop or automatically from the bz Gas Detector, or sensors made wireless by the bz Sensor Interface, sending a command to the bz Control Interface to shut down relays and solenoids controlling power to critical equipment. The bz Estop is portable and can be moved to alternative work stations as needed, or it can be permanently mounted. Thus creating a safe work environment throughout your site. The ability of the bz Estop to immediately shut down “hot” machinery by the safety system allows for a safer, less volatile work environment, providing peace of mind for workers and management. • Humidity: 80% RH max. The bz Estop communicates using a 802.15.4 wireless communications protocol. The bz Mesh Network is both a self-forming and self-healing network, making installation and operation easy. The bz Mesh Network enables data flow back to a bz-developed or customer-provided Control Center Interface. Integrating electrical and pneumatic sensors and controls, the bz Estop provides flexibility and adaptability in potentially volatile situations, while making remote system monitoring and control a seamless part of how you do business, wirelessly. The bz Estop comes in aluminum, waterproof, UL-approved Class 1 Div 2 enclosures with a 22mm button designed to operate effectively even in the worst of conditions. The bz Estop contains two visual indicators. A green power LED and a red charging status LED. The green LED will illuminate when the power to the device is on. The red LED will illuminate when the Estop is charging. The red LED will turn off once the charging cycle is complete. The bz Estop uses a rechargeable Lithium Ion Polymer battery. The bz Sensor Interface is the key to making your sensors wireless. Communicating data and alert messages between individual devices- such as the bz Estop, bz Gas Detector, and bz Control Center Interface- allows for equipment to be monitored remotely. Whether monitoring transducers, flow meters or air gauges, the bz Sensor Interface can be customized to fit your specific need and your own sensors. The bz Sensor Interface is compatible with most major brands that serve the oil and gas industry. In most cases, we can easily integrate your existing sensors to communicate within our system. By working with our customers to develop a customized system, the bz Sensor Interface enables you to collect data remotely and make intelligent decisions more efficiently. The bz Sensor Interface has four analog/ digital inputs accommodating analog current from 4 to 20 mA, or voltages from 0 – 24 VDC. Input signals are transmitted across the bz Mesh Network and can be easily mapped to control one or more output voltages on the bz Control Interface. The bz Sensor Interface is easily configured to work in conjunction with the other bz Sensor Solutions’ products to create a customized solution to meet your monitoring and safety needs. The bz Control Interface manages the power supply to equipment in an emergency situation. Simply put, it is the “control” side of any relay. 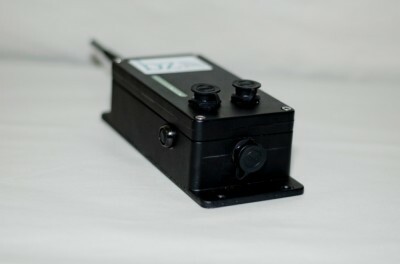 Working in conjunction with the full suite of bz products, the bz Control Interface is able to react automatically to commands that it receives from the bz Gas Detector, bz Estop and other sensors communicating through a bz Sensor Interface. This immediate reaction can save lives, as well as time lost in the event of an accident. Both intelligent and powerful, the bz Control Interface manages its equipment over a wide area up to one mile between nodes of the bz Mesh Network. Using a 5, 9, 12, or 24 VDC discrete signal, the bz Control Interface monitors alert messages passed by sensor devices over the bz Mesh Network. Depending on the custom settings you choose, the bz Control Interface reacts accordingly to shut off equipment. This way, critical equipment can be monitored and controlled remotely by the bz Mesh Network. The bz Control Interface has a wireless control switch with four digital VDC outputs that can be individually configured to control your equipment. The bz Control Interface is easily configured to work in conjunction with the other bz Sensor Solutions’ products to create a customized solution to meet your monitoring and safety needs. The bz Mesh Network has unlimited capabilities to form – and heal – its own network, but at some point it has to communicate with the outside world. The bz Control Center Interface is the simplest way to get bz network data to a facility computer and the World Wide Web. The bz Control Center Interface is contained in a waterproof aluminum enclosure and comes with a Class I, Division II, Commercial/Industrial UL rating safe for operation in explosive areas. Each bz Control Center Interface has a 10-foot cable allowing the device to be remotely placed from the host computer. The Interface is light enough to be portable and comes with a magnetic base allowing rapid attachment to any metal surface. If portability is not required, then the bz Control Center Interface can be mounted permanently using the mounting holes located in the base of the unit. Ranges from the bz Control Center Interface will depend on the type and size of antenna attached to the unit but effective Line-Of-Site ranges of ten miles is not uncommon. The bz Control Center Interface works with both bz Integration and Control Software and the Cloud network, giving you two different options for sending data to the Web and for connecting multiple devices to the network. Our software supports an unlimited number of sensors and approved and monitored end users. Power for the bz Control Center Interface comes from its USB connector to your computer, so external power is not required, regardless of your location. Traditionally, the limiting factor to all sensor control systems has been cost – Well, not anymore! Thanks to a partnership between bz Sensor Solutions and Sprint, the cost of interfacing a sensor network to the World Wide Web is limited to the cost of the bz Cellular Bridge system. The bz Cellular Bridge is a small device that translates data from sensors to computers anywhere in the world. Built to operate effectively with minimal maintenance even under the worst of conditions. The bz Cellular Bridge communicates up to a mile between self-forming and self-healing bz nodes. Once communications have been established between the network and the cellular bridge, a powerful Sprint modem connects the network to the cellular system allowing the transfer of data to any other modem on the Sprint network. Cloud-based software, also on the Sprint Network, enables access to an unlimited number of sensor network inputs and end users and allows sensor and video control from anywhere on the Sprint Network. Since the bz Cellular Bridge system works off cell modems, there is no need for a bz Command Center interface or a standalone computer– just use the Sprint modem contained in most Microsoft Windows-based computers or tablets to access the sensor network without the need for additional connectors or attachments. The bz Cellular Bridge comes with its own power supply, or can be powered from a solar cell providing sustained power in remote locations over a long period of time. The durability of the bz Cellular Bridge greatly reduces the need for daily or even monthly maintenance is while providing data to users around the globe. Public facilities change continually, and nowhere is this more evident than in the healthcare sector. Most hospitals start as a single building and then expand outward as technology develops and the community grows. Eventually, patients and visitors may find it difficult to navigate their way throughout an expansive facility without getting lost. This increases stress in patients and visitors and requires staff to support lost customers, taking them away from other important work and ultimately increasing wait times. The bz Hospital SM&RT Tracker is a simple, low-cost solution to the problem of patients and visitors finding their way through a hospital. A personalized tool, the bz Hospital SM&RT Tracker that can be programmed with specific directions to a location via any computer or KIOS machine when it is given to the patient/visitor. The bz Hospital SM&RT Tracker knows its location by dead reckoning with the range and bearing from a transponder- no need for GPS systems, which rarely work at all inside buildings. The Hospital SM&RT Tracker also may be used to track hospital equipment. Expensive and critical equipment can be moved from one area of a hospital to another during periods of urgent need. Problems arise when the home department doesn’t know the equipment’s location, once again needlessly typing up staff time when searching for it. With the bz Hospital SM&RT Tracker, the equipment is found within the hospital via the bz Command Center allowing for rapid retrieval. The bz Hospital SM&RT Tracker also can be used to restrict areas to authorized personnel. The Tracker can identify any person entering an area that is restricted to authorized personnel. The same system that sends people throughout the building can restrict entrance to those areas with no additional cost or software programming required. The bz Hospital SM&RT Tracker is not an RFID product. However it is simply the best value solution for patient tracking and physical security. The bz Lone Employee Tracker is a small, rugged GPS tracker designed for commercial and industrial use. Built from hardened Polymers, the Tracker can withstand high temperatures, moisture, and general abuse without damage to the case or the electronics inside. The bz Lone Employee tracker is powerful and smart. It is designed with a robust computer mother board that allows the addition of up to two (2) optional sensors, providing additional protection to both the user and their team. The bz SM&RT Tracker is limited to outside areas and depends on GPS. Once a Lone Employee Tracker is activated, it links to a bz DIBS, Cellular Bridge, or Command Center Interface. The system then tracks location and sends tracking data to any remote site using the bz software. A single LED light shows when the unit is charging. Running on 3AAA NiMH batteries, the power draw is very low, allowing for extended use. Equipped with either a belt clip, it is easily integrated in any manner of dress. The device is activated by a simple on/off switch and contains a rechargeable USB port for charging from a vehicle, computer, or wall power outlet. The bz Command Center Lone Employee Sensor is based on ZigBee SM&RT Tracker sensors, so the two types can be meshed with one another. This capability allows bz communication software to receive data from sensors even if they are not within the bz Command Center, Control Card, or bz Cellular Bridge range or a clear line of site such as warehouses or small buildings. answer has been solar cells, but PV arrays take up a great deal of space and have limited value during the winter, as cloudy and snowy days can greatly reduce solar cells ability to create energy. However, bz Sensor Solutions offers a new and innovative solution to onsite sensor power needs. The bz Power Pole is a twelve-inch thick pole covered with a polycrystalline flexible solar panel creating a viable solar power source with only an eighteen-inch square footprint on the ground. The power pole is self-contained with built in batteries, bz sensors, and a bz Cellular Bridge which communicates with any user with Internet access. What makes the bz Power Pole unique is that in addition to the solar cell, the bz Power Pole has a high efficiency wind turbine at the top, allowing the system to continue to generate power at night or even on the cloudiest of days. Like every bz product, the bz Power Pole is part of bz’s robust self-forming and self-healing communications network. The bz Power Pole functions like any other node in our network. The bz Power Pole also includes a bz Cellular Bridge, so not only does it communicate with all of the sensors in the local network, the bz Power Pole also communicates with the world via the Sprint Cellular Network. This allows to the user to collect video and sensor data remotely and to send this information to any place and or person with Internet connectivity via bz Cloud software. The bz Power Pole is not limited to video and sensor data; it also supports lighting tasks using bz LED lights. Remote street and area lighting can be controlled and powered using a bz Power Pole without the funding and effort required to connect to an existing power grid. bz Power Poles come in three heights: a ten-foot Pole that can be installed and moved by only two workers; a fifteen-foot Pole that is perfect for sensor collection; and a thirty-foot Pole that allows LED lights to act as remote lighting for most normal lighting activities. The bz Personnel & Asset Tracker has unlimited capabilities to form its own network then heal the network when things happen. But what make the bz system complete is the ability to connect to the Sprint system providing communications from just about any part of the country. The bz Asset Tracker contains both an accelerometer and Global Positioning System (GPS) which allows the collection of G force, vibration and positioning data all from a single self contained piece of equipment. This product works from vehicles, pallets, small portable buildings and is rugged enough for use even on heavy equipment allowing without the needs for power, communications infrastructure or additional sensors. The bz Personnel & Asset Tracker is contained in a waterproof aluminum and uses solar cell that has both a metal frame and a hardened glass top protecting the Asset Tracker electronics from most road and workplace hazards. There are two versions of the bz Personnel & Asset Tracker: one version uses the bz Radio Frequency (RF) engine and communicates via either a Sprint Cellular Bridge or the bz Communications Center Interface to a computer. The advantage of this system is that with the exception of the Sprint Cellular Bridge there is no monthly connection fee. In many cases, communications with the outside world requires that each tracker has a cellular modem onboard; this allows the device to work from any site having cellular coverage. The cellular version of the bz Asset Tracker is very versatile but it does come with a connection fee. The bz Personnel & Asset Tracker communicates to the rest of the network using an 802.15.4 wireless communications protocol over a range of one mile between nodes. 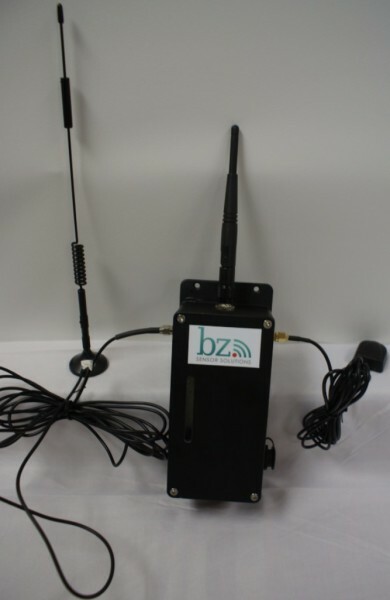 There is no need for an external antenna connection as part of the bz Asset Tracker. Ranges from the bz Asset Tracker will depend on the type of RF environments it is exposed to but ranges in open environments up to a mile are common. ​bz Sensor Solutions line of bz Gas Detectors, Sensor Interface, Control Interface and the bz Control Center Interface can help you stay in control of the risks your team faces. This schematic demonstrates how the suite of bz products work together to keep your workers safe and productive.